Philips Animal Garden is a non-profit organization that was founded in 2009. Philip Conrad Merryweather, an Aruban native, transformed his passion for exotic animals into taking care of mistreated and abandoned animals by offering them treatment, food, and shelter in his own garden. What all started with rescuing a little kitten found in a dumped bag at a young age has resulted in rescuing and adopting many animals in the years afterward. Philip Conrad Merryweather built the rescue and rehabilitation center from scratch, with his own hands and money, and with the help of his relatives, especially his mother and his grandfather. In the early years, shelter and cages for the animals were designed and custom-built by Philip. Eventually, Merryweather’s goal is to upgrade the premises to a world-class animal shelter with veterinary care and a 24-hour staff. Because the garden is a non-profit organization, it depends fully on local investors and public donations and income from ticket sales. Is Philips Animal Garden a Zoo? Given the variety of the animals, you’ll get the feeling you are visiting a zoo. However, the size of the location and how it was designed will make you feel as though you are visiting a children’s farm. But Philip’s Animal garden definitely will be a zoo through the eyes of children. It is a wonderful thing to do when you are visiting Aruba with kids. Currently, the collection of exotic animals at Philips Animal Garden is really amazing, ranging from parrots to pigs, from donkeys to deer and from cows to crocodiles. Even snakes like the boa constrictor have been given a place to live. Philips Animal Garden also houses a large collection of exotic birds. More than 50 bird species currently inhabit the garden. They come from Aruba and from neighboring Caribbean islands like Curaçao and Bonaire. 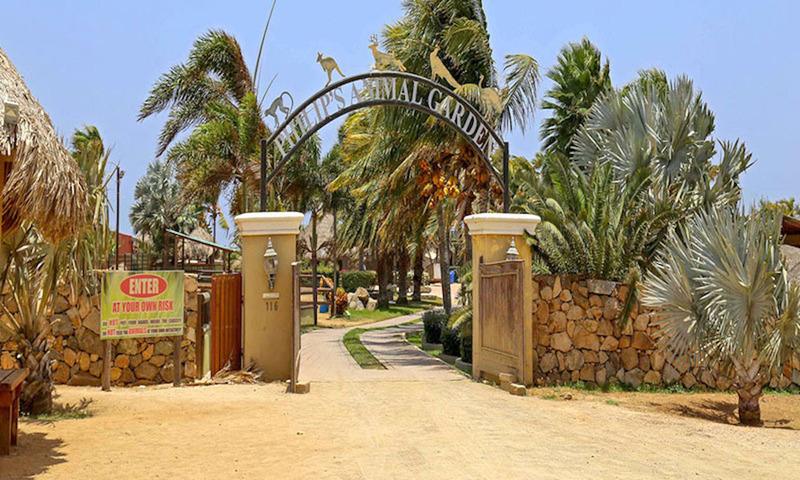 Philips Animal Garden is located at Alto Vista 116, Noord, Aruba. It is not too far away from the Alto Vista Chapel that’s located a little further north. From Monday to Friday, Philips Animal Garden is open from 9 AM to 5 PM. Tours are scheduled every 30 minutes. On Saturdays and Sundays opening hours are from 9 AM to 6 PM. Children between the age of 3 and 13 years old have free access to the farm. Children aged 13 years and up pay $5 for a ticket. Beverages and snacks at the Beverages Corridor. A documented list of animals with an extensive description of each species. The possibility to feed the animals and interact with them. The opportunity to take pictures. Make sure you check with the park ranger before doing so. Free parking for disabled people on the premises. Easy wheelchair access to the whole garden. Ramps and allocated areas for disabled visitors. Multiple resting places where visitors can take a break and enjoy some shade. A great educational and unforgettable experience for your children.